Aboriginal and Torres Strait Islander peoples mark Australia Day as Survival Day. Come along to one of these events to show your support. Australia Day is not a celebration for all Australians. Aboriginal and Torres Strait Islander peoples mark this day as Survival Day. Since colonisation, Aboriginal and Torres Strait Islander peoples have been subjected to government-sanctioned violence, policies that removed children from families, the removal of people from their lands and the denial of self-determination. This year on Survival Day, let’s stand in solidarity with Aboriginal and Torres Strait Islander peoples and recognise the survival and resilience of the oldest living culture in the world. Below is a list of Survival Day events around the country. This list is not exhaustive. If you know of events that we have not included, feel free to let Tracey.Foley@amnesty.org.au know. ‘Please join us this Invasion Day to reflect on our past and celebrate our strength by MARCHING THROUGH ZILLMERE and sharing stories of survival back at Koobara. 9am Assemble at Kurbingui Youth Development (right near Zillmere train station) for Welcome. 10am March down Handford Road, with Aboriginal and Torres Strait Islander flags and banners. ‘Join First Nations People in Meanjin and around the continent in our fight for justice and rights. We will be gathering at Emma Miller Place, Roma Street at 10am, starting speeches at 10:30am, and marching through the city and South Bank at 11:30am. ‘Balaangala Community Group acknowledges January 26th as a day of sorrow and reflection for many First Nations people and other Australians. You are invited to join together in acknowledging First Nations people as the custodians of this land and to reflect on the continued impact of colonisation. ‘Uncle Eugene Bargo starred in the SBS / NITV documentary series ‘Surviving’. Leon Filewood is a young lawyer turned award-winning comedian. What do these two First Nations men have to say about reconciliation in Queensland? Join us on January 26th! 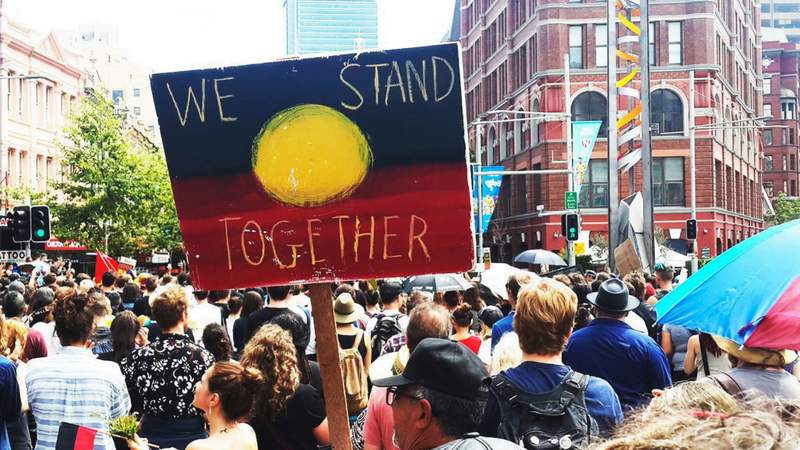 ‘We are calling on members of the Aboriginal and Torres Strait Islander community and our supporters to stand with us on Invasion Day 2019 – Saturday January 26th, an Annual Day of Protest. …Due to the likely heat the march will be starting early with main speeches happening at the Aboriginal Embassy where we will be providing opertunities for in depth discussion of the issues. It is offensive to celebrate genocide and the attempted subjugation of over 500 different nations. Established in 2001, Yabun (meaning ‘music to a beat’ in Gadigal language) is a free event that features live music, a bustling stalls market, panel discussions and community forums on Aboriginal issues, children’s activities, and traditional Aboriginal and Torres Strait Islander cultural performances. Yabun Festival welcomes everyone to join us in this one of a kind event which honours the survival of the world’s oldest living culture. COOEE is all about celebrating the survival of the oldest living culture in the world, an inclusive day for all to join us! Join us in celebrating the oldest surviving culture in the world!! Australia has a black future! Tickets online $34 or $40 at the door on the night! DJ Peter Gunz, Nooky, Dallas Woods and Street Warriors are locked in for Western Sydney’s newest and biggest event hosted by your MC Sean Choolburra! Doors open for VIP guests at 7 PM, GA guests can enter the venue from 7:30 PM. Kings Domain Resting Place, located near Linlithgow Avenue opposite Janet Lady Clarke Rotunda in Naarm (Melbourne). We commemorate all Sovereign First Peoples who defended and died in the Frontier Wars and massacres across Australia. We recognise their resilience, courage and bravery protecting families, communities, and Country, and that sovereignty has never been ceded. This always was and always will be Aboriginal land. We always remember, January 26. Please use #WeAlwaysRemember when you invite others. Please note there are no trains from outer suburbs – you will either need to make your way in by other means, or travel in by train from a closer station. We are calling on members of the Aboriginal and Torres Strait Islander community and our supporters to stand with us on Invasion Day 2019 – Saturday January 26th, an Annual Day of Protest. We will stand together and march together as our Elders have for the last 81 years this January 26 to protest the ongoing colonial violence on our people. Belgrave Survival Day 2019 celebrates Indigenous culture with live music, dance, speakers and activities for all the family. Presented by Songlines Aboriginal Music, Share the Spirit is the state’s longest running Aboriginal music festival, running over a decade. This is a family friendly event which draws on the collective talent of the local Aboriginal arts community. Featuring Mojo Juju, The Stiff Gins, Birds and more. This is a free event. ‘…the 26th of January is a day of sadness for the first people of this land as it is a yearly reminder of the horrors that transpired at the hands of colonisation. It is not a day of celebration, and it is not a day that should be thought of with pride. It is a day where we need to come together in solidarity with our Indigenous brothers and sisters to fight for a change of date, and for treaties that respect Aboriginal culture, custodianship of the land, education, and freedom. All Indigenous folk who would like to attend this event are given free admission. All proceeds from this event will be donated to the Victorian Aboriginal Health Service -VAHS. Calling all community and supporters to stand with us on Invasion day. We will be meeting at the TAC office at 11:10 AM on Saturday and be heading towards Parliament Lawns arriving around 11:50. Let’s respect the survival and resilience of Aboriginal people and change the date. Join the event so we can keep you posted with further information. ‘Tandanya National Aboriginal Cultural Institute is proud to present the 2019 “Survival Day” Concert and Event at Semaphore Beach featuring the ICONIC “COLOURED STONE” performing live on stage. Tandanya invites you to come along and be a part of this annual event under the theme of “Still SURVIVING, Still THRIVING”. Acts include MC Natasha Wanganeen, Nuh’thin, Yet, CAPER, Vonda Last, Yorke Band and many more! ‘The Gynburra 2019 is now in its fifth year. Held on the traditional lands of the Narungga people, the festival is a celebration of recognition and acknowledgement of our cultural and spiritual connection to Country. A family-friendly event with activities for the whole family to enjoy held over three days, 24th-26th January 2019. The Gynburra 2019 centres around the annual Clem Graham Senior Butterfish Competition, a long tradition that brings competitors from all over to compete for the prestigious titles of the ‘Butterfish King’ and $1000 prize money and the Under 18s Division, Geoffrey ‘Scooby’ Webb ‘Butterfish Prince’ and prize money to match, please be sure to register. There are plenty of other ways you can also support the campaign.